A recent symposium presented by the department of Slavic languages and literatures and the Canadian Opera Company brought together students, faculty, and opera enthusiasts for an in-depth discussion of two of the most important cultural works from 19th-century Russia. Co-sponsored by the Munk School of Global Affairs & Public Policy, the Centre for Drama, Theatre and Performance Studies, and the Centre for Comparative Literature, the event explored Eugene Onegin, a novel in verse by Russia’s national poet Alexander Pushkin, and the opera adaptation of the novel by Peter Ilyich Tchaikovsky, one of Russia’s most famous composers. The symposium featured presentations on aspects of the novel in verse and opera from members of the University of Toronto’s Slavic department and Faculty of Music, as well as speakers from the Canadian Opera Company. Boris Gasparov, professor emeritus of Russian and East European studies at Columbia University and a leading authority on Russian literature and opera, gave a keynote lecture. Organization of the event – which was open to anyone interested in opera and Russian culture – was led by Kate Holland, an associate professor of Russian literature, and Christina E. Kramer, a professor of Slavic linguistics. Catherine Willshire from the Canadian Opera Company's education and outreach department provided speakers and organizational support. The symposium was especially valuable to students in the Slavic department, many of whom examine the well-known novel in their studies. Eugene Onegin is considered a masterpiece of Russian literature and studied in several courses offered by the Slavic department. When faculty members of the department learned that the Canadian Opera Company was staging a production of Tchaikovsky’s adaptation this fall for the first time in 10 years, they seized the opportunity to organize the symposium and incorporate the opera into their teaching of the novel. 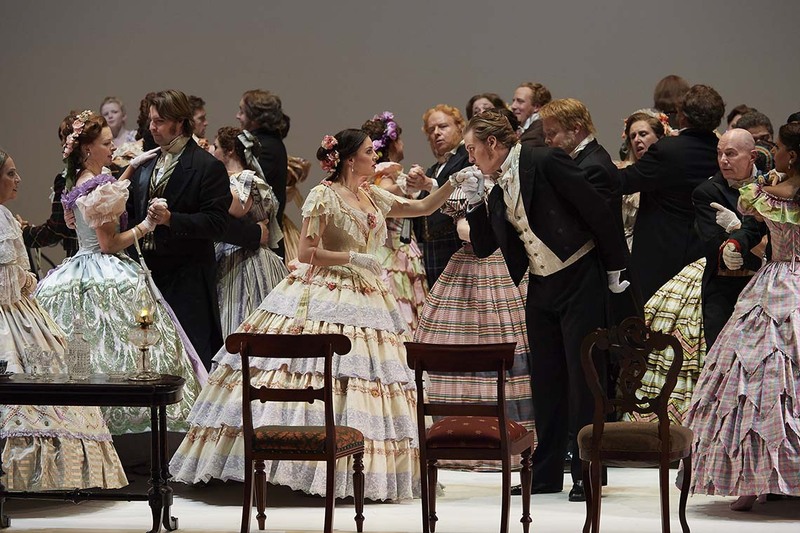 In addition to encouraging students in the Slavic department to attend the symposium, Holland and Kramer arranged for 120 students to attend a dress rehearsal performance of Eugene Onegin at the Four Seasons Centre for the Performing Arts in Toronto so they could experience the opera firsthand. For many students, it was their first time at the opera. Rebekah Robinson, a second-year New College student majoring in history and Russian language and literature, read an English translation of Eugene Onegin this semester for Holland’s course on the golden age of Russian literature. She attended the performance to complete a paper that compares and contrasts the novel and its opera adaptation. Robinson said that seeing the opera – which is sung in Russian and retains much of the poetry from passages of the novel – helped her view the novel from a new perspective. “A highlight for me as a student studying Russian was to find segments of the opera where I could understand the sung Russian words without the surtitles and was able to gather additional meaning about the relationships between the characters in a way that isn't necessarily conveyed in English,” she said.